Coolpad today announced its first new smartphone launch in the Indian market after being dormant for months. The new Coolpad Mega 4A is an entry-level smartphone that is priced at a competitive Rs 5,999, and is already available for purchase in retail stores across the country. During the launch of the Cool Play 6 last year, Coolpad had announced that it would be bringing the entry-level Mega 4A smartphone in the country. However, it took more than six months for the company to finally launch the entry-level smartphone in the country. This could be due to the financial issues that have been plaguing its former major investor, LeEco. Since then, the company managed to find another investor in Power Sun Ventures who infused $300 million in Coolpad earlier this year. While making the announcement on Twitter, Coolpad did not reveal the full specifications of the Mega 4A. However, it did reveal that the smartphone features a 5-inch display and runs on Android 7.0 Nougat out of the box. That it runs on the outdated Nougat should not come as a surprise, though, as the Mega 4A launch was delayed by 6 months. 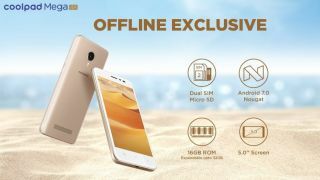 Other specifications include 16GB internal storage and support for microSD cards up to 32GB. It also includes support for dual SIM, but it is not known yet if it comes with a hybrid slot or not. Coolpad had also revealed that it will add support for Amazon Alexa in its devices via an OTA update, but it remains to be seen if the Mega 4A comes with this update out of the box.